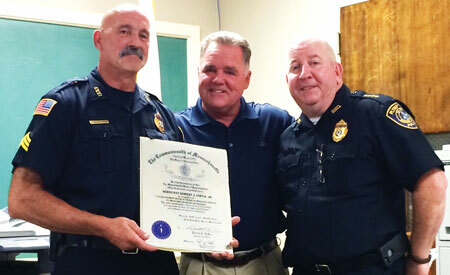 Representative Thomas J. Calter, center, presented retiring Plympton Sgt. Robert Costa, left, a Proclamation from the Massachusetts House of Representatives during Monday night’s meeting of the Board of Selectmen. Adding his good wishes to the 30-year veteran is Plympton Police Chief Patrick Dillon, right. The Plympton Board of Selectmen meeting Monday night was bittersweet honoring retiring police Sergeant Robert “Robbie” Costa, after 30 years of service to the town. There was standing room only with all the family, friends, and Brothers in Blue who came to add their well-wishes, including a citation from the House of Representatives, presented by Representative Thomas Calter who noted that a copy of his citation will be archived at the State House, along with citations issued to such notables as Paul Revere. Selectmen were finally able to sign an agreement between Carver and Halifax to create a regional public television studio, the culmination of three years of work, said Selectmen Chairman Mark Russo. Carver and Halifax, whose public cable television station has already been covering Plympton events for more than six months will now officially join with Plympton to create a studio that will cover all three towns, and be known as Area 58 Studios. The agreement now needs to be signed by Carver and Halifax Selectmen because there were minor details that were changed at the last minute to the document. Karen Foye was appointed to the studio’s board of directors for a three-year term, while Russo was appointed to a two-year term. The Selectmen were informed that Town Counsel determined that the Plympton school committee has ultimate control over school grounds and buildings, including the use of fields. This concern was recently raised as there has been interest in leasing out school fields to private athletic clubs. Recreation Commission Chairman Kevin Kaupp and and his committee came to the board last meeting to determine how to proceed. Jon Wilhelmsen, chairman of the Plympton School Committee spoke to the matter, having just returned from a school committee meeting, and told selectmen that the school committee under its clarified authority will allow the Recreation Committee to “outsource” maintenance of the sprinkler systems and use of the school owned fields outside of school hours. Wilhelmsen also spoke to the fact that the school committee was reticent to approve any form of solar panels on any of the Dennett School’s three roofs, despite the presentation to selectmen at their last meeting. As the school committee has the last word on this matter, this is a serious hurdle to the proposed project. Members of the Recreation Commission were present to discuss vandalism to basketball backboards at the Parsonage Road recreation area. They were informed that further damage had occurred and the board discussed whether or not to file another insurance claim to replace them again, fearing of increased insurance premiums in the coming year. All agreed it was best to try not to file an insurance claim, and pay for the cleanup and replacement backboards from other funds. They also will choose a different material for the backboards, such as Plexiglas or metal as opposed to glass. Discussion of possible lighting and/or security cameras at the courts was tabled for a future meeting. Committees recently formed to focus the board on important projects reported progress, including the DOR report committee chaired by Selectperson Christine Joy and the public safety building committee chaired by Selectman Colleen Thompson. According to Thompson, the public safety building committee has reached a consensus that they would like to attempt to plan a new public safety complex on the current campus near Town House, even seeking to have some preliminary engineering studies done. In a related matter, the selectmen voted to take the town-owned Maple Street parcel adjacent to property owned by Chairman Russo off of the possible site-list, so that Russo will not have to recuse himself from every vote related to the proposed new public safety complex. Property owned by the town on Center Street is still a possible back-up site. Finally, the Board, with regret, accepted the resignation of Kristen LeVangee, the selectmen’s assistant as of August 27, 2015. The board is currently searching for a replacement. • Plympton Mobil and Convenience will change its name to Plympton Gas and Convenience. Their contract with Mobil has ended. • The board will meet Monday at 6 p.m. on the following four dates: August 31, September 14, September 21, and September 28.